When Carol Heffernan's elderly next-door neighbor died and the house was listed for sale, the Chicago landscape designer scraped together her savings, refinanced her own house, and bought it with the idea of turning it into an office. "I didn’t want a big three-story condo to be built next door to me," says Heffernan. "My aim was to redesign it as a space that could be sort of a showplace for clients to come look at our firm's 'wares,' if you will—a completely finished and usable space so people can envision what their yards might look like. But also to showcase different things too, like our masonry work, unique plantings, that kind of stuff. Along with our design capabilities." The 675-square-foot house Heffernan bought in the northwest Chicago neighborhood of Albany Park was built in the 1880s and had an expansive setback—a deep front yard—with a tiny cottage extending to the back alley. "The building was so gross we ended up tearing it down to the studs," recalls Heffernan. Odd windows and construction indicated it might have once been a barn. Scrawled on one of the shiplap boards Heffernan and crew found a three-digit phone number for a lumber company. Heffernan and her carpenters ended up having to rebuild the house with stone pillars and a front porch that was a nod to the Craftsman architectural style seen throughout the neighborhood, along with cottage-style frame houses, brick two-flats and pre-World War II apartment complexes. The house is now her workspace. "I go out my back door, take about 15 steps, and head over to my office. For several years my office was in my basement, which was cold and dark. Once I relocated next door I was so happy; I put in windows and skylights and have a sunny space." Heffernan bought the next-door property in summer of 2008 and started construction that fall. One of the first things to deal with was the trunk of a giant catalpa tree with a 4-foot diameter trunk and even wider root system. Using shovels, pickaxes, and a Bobcat, it took Heffernan and a crew of five about a day and a half to dig it up. "That sucker almost tipped over the Bobcat," Heffernan laughs. On a raised foundation, carpenters worked on the Craftsman-style structure that became Heffernan's office. Chicago is known for its heavy snow storms and construction stopped in the winter. At one time, Heffernan included landscape maintenance as part of the services offered by the firm. "I shovel my own sidewalk, but we don't do snow removal anymore. Now, it's so fraught with high insurance rates because of liability. Years ago, I was out with my foreman at 2 a.m. shoveling snow for a client. It had to be hand-done because you can't do a three-story staircase with a snowblower." So there's snow and then there's rain. Sometimes, a lot of it. After the massive tree trunk was removed, nothing was left in the office yard but some weeds and "volunteer" plants. Nonstop rainfall—sometimes 9 inches deep—the following spring meant building the hardscape was a start-and-stop process. The property adjacent to Heffernan's house was about a foot lower, so topsoil was added to make it even. Everything was cleared and scraped clean, then the patio and paths were installed and an outdoor fireplace was constructed in the heart of the front yard. She installed a new wrought iron fence that coordinated with her own at the front edge of the property, for privacy, safety, and to contain her dog. Hornbeam trees were planted along Heffernan's walkway near her neighbors on the other side, "so I didn't have to look at their ugly building," she explains. The wall of the three-story apartment building hovers on the other side of her office property. Parallel with the sidewalk and front fence, she planted evergreen yew hedges, which visually intersect but don't touch. Her brick entry path jogs through the hedges; "a design trick so it looks like and becomes a wall," says Heffernan. "People walk past on the sidewalk and try to look over or through but they can't. I see some standing on their toes trying to see what's going on, but that's the point—to create a wall of privacy." A wall fountain creates additional privacy, acts as a sound barrier, and creates architectural interest in the new yard. Landscaping around the fountain is balanced for a peaceful, Zen-like atmosphere which is a welcome respite in urban garden design. Looking from the front path, the hornbeam trees have quickly grown to cover the brick wall of the apartment next door, making the space look like an urban escape. Heffernan now has nice views from most vantage points, including the front porch of her office, which looks out over a lawn, maturing trees and shrubs, and an inviting patio. An overhead view of the popular Golden Japanese Forest Grass that line a pathway. One of the planting beds is filled with Mexican river rock and planted with specimens seen throughout the landscape, including hostas, Viburnum with the big white flowers, and Japanese Forest Grass. Looking toward Hefferman's own house from the middle of her office front yard reveals the pavers she takes to work. 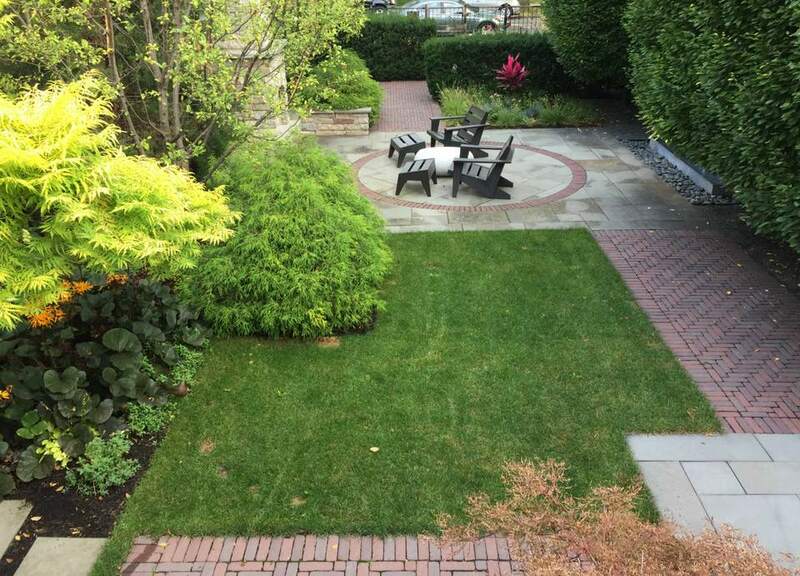 Heffernan's dog enjoys the new patio, which is laid with pavers and a circular detail lined in bricks. Growing in a raised bed of concrete blocks that make up the "hellstrip" are a variety of ornamental grasses and flowering perennials and annuals. Heffernan doesn't limit her landscaping talents strictly within the walls of her own property. She built a raised bed in the parkway in front of her house—that strip of land between a curb and sidewalk, sometimes referred to as a hell strip. Measuring about 10 x 30 feet, she has experimented with flowers, hostas, and other plants that have grown ​into a mature garden. "Of course there are people who walk through it and leave their beer cans, but I've been out there gardening, and someone will walk by and say, 'Hey, that's really beautiful.' It touches my heart that it affects people in the neighborhood." Heffernan moved to the neighborhood in about 1990 and has gradually updated the 1920s brick house and landscape. At first, "I had a beat-up concrete patio, a broken sidewalk, and a bunch of ugly hostas. That was it. 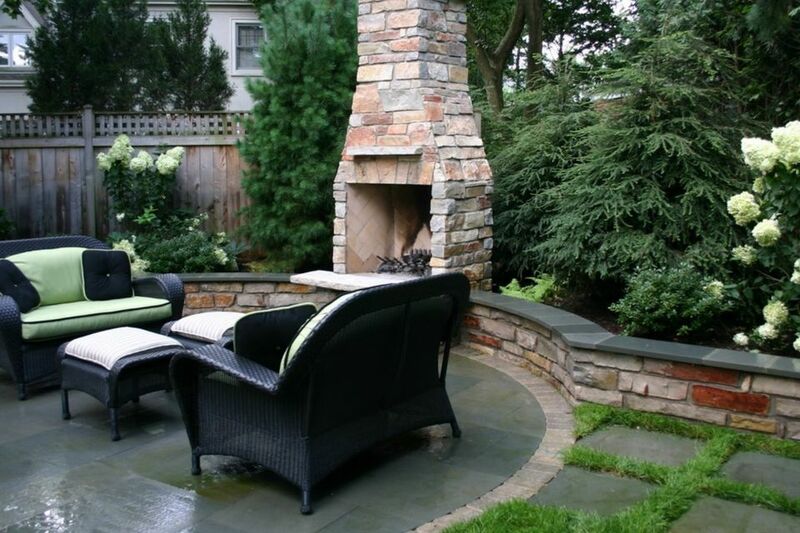 Unlike my clients, my own yard was not designed all at one time." The designer has added a patio, pergola, a pond, and rebuilt the pond to make a more beautiful space. Landscaping at Heffernan's house is "just a collection of stuff I've found over the years," she says. For clients, "I try to choose plants that give them the most bang as far as color and texture. I give them a big array of stuff and do lots of mixed borders. So, it may be flowering deciduous stuff, evergreens, flowering perennials, and grasses. I look for color in foliage, because many perennials only bloom a couple weeks out of the year." Faded hydrangeas are left on a shrub in Heffernan's yard to pick up the colors of surrounding trees in autumn. The evergreen is Japanese White Pine; Pinus parviflora 'Glauca'.